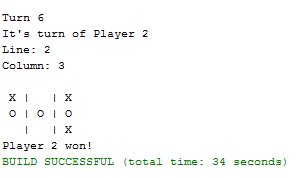 The Tic Tac Toe game in Java! Also known as noughts and crosses! This is a simple version, to be played with two people. Note that in a simple Java application like this, the result came out around 300 lines of code. If you are Java programmer, click to see the full commented code and explanation about the Tic Tac Toe Java Game creation.